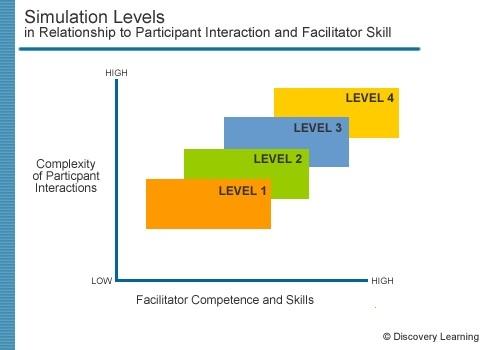 This Simulation Classification Guide, developed by Discovery Learning, first published in the ASTD’s Learning Circuits online resource in 2003, is intended to help ensure trainer and facilitator success when using simulations by matching trainer skill level and needs with simulation requirements. overall, to improve the facilitator and participant’s simulation experience. 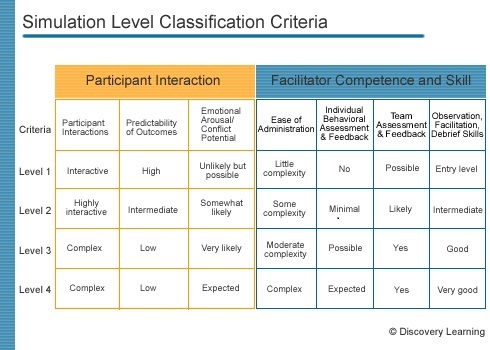 Though not yet widely adopted, this Simulation Classification Guide is an accepted measure of what facilitators and participants can expect to experience in a simulation activity. Designed to be simple to use, the guide can be applied to any simulation available today. All simulations sold by Jamesson Solutions have been measured and rated against this Simulation Classification Guide. The Simulation Level is clearly listed on each simulation product page in this website so visitors can be most informed regarding what to expect from a simulation.